Kamal Haasan starrer 'Uttama Villain' is in the eye of the storm yet again. The early morning, noon and afternoon shows of Kamal Haasan-starrer “Uttama Villain” on Friday were cancelled across Tamil Nadu. A few fans were even given tickets to another movie. After religious outfits and worried Collectors, an old villain contributed to the derailing of Kamal Haasan's latest release Uttama Villain on a bright May Day morning: Money, money and more money. With non-payment of dues still an issue between the financier Eros International and the producer Thirrupathi Brothers, the movie's special and first two shows stood cancelled summarily, "Once we get the financial clearance from Eros International, only then will the distributors send us the theatre list. After that, we will send the digital projection keys to theatres so that they can screen the movie. We hope that they manage to sort out these issues soon," said a source with Qube Cinemas, which is digitally distributing the film. Incidentally, Eros International has not stopped the film from being distributed overseas, where shows are currently being screened. Qube confirmed that 184 theatres had asked for the print ‎in advance and had it transmitted to them, but most others were yet to commit without clarity on the Ramesh Arvind-directed film's release. "Our movie Vai Raja Vai is releasing on 175 screens and we had not scheduled for a morning show, but enquries are increasing. Huge numbers of theatres played our film for the morning, noon and matinee shows" said R Rangarajan, Director, AGS Entertainment.‎ Crores of rupees worth of overpriced First Day First Show tickets had to be refunded, as Kamal's film lost out on a good holiday and possibly the long weekend. Distributors have had a bone to pick with Eros International ever since Lingaa and Kochadaiiyaan were box office duds last year. However, all the parties involved, including Studio Green's K E Gnanavel Raja, spent most of the day closeted in the Film Chamber, trying for the resolution, "Financial tussles between N Lingusaamy's production house Thirrupathi Brothers and Eros International and the distributors are getting sorted out‎ and money will be settled soon. Fans should be patient, the film will release today," said Kamal's representative. Vishwaroopam, the actor's last release was also mired in plenty of controversy, releasing all across the world and India, except in Tamil Nadu - hitting screens only after 10 days. With news of the morning show's cancellation getting around to the fans only when they reached theatres for their release rigmarole, there was outrage and shock that their 'Ulaganayagan's' film wasn't releasing. "There were so many preparations for a special puja especially because his film is releaing after nearly two years. This is the work of jealous people," said Kamal Dinesh, a fan club member outside Woodlands Theatre in Royapettah, Ground Zero for Kamal fans in the city. There was even a threat of violence that led to the cops lathicharging them away to maintain the peace. Fans showed up early at theatres, where giant cut-outs of Kamal Haasan announced the release of the much-anticipated film. "We have been waiting since 7.30 am without coffee, without food. We are very upset that people abroad are getting to watch the film and not us," said a young man. 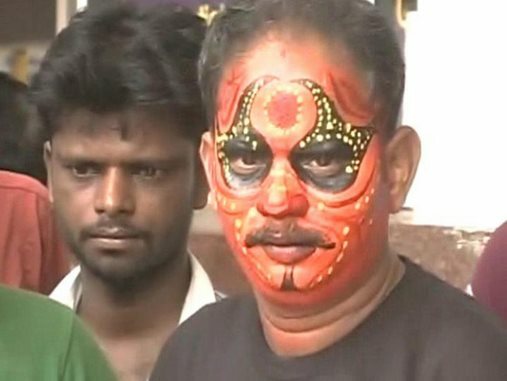 Another man had come with his face brightly painted like Kamal Haasan's masked face in the movie. The film has been screened abroad. Lots of other theatres across the city quickly switched over to Gautham Karthik's Vai Raja Vai instead, opting to let people watch that film instead of a refund, "As of now we have offered refunds for the morning and noon shows but also screened VRV for those who just want to watch a film. I've cancelled the evening show, opting for Kanchana -2 instead, but i'm still holding the night show for UV if things work out" said Rakesh Gowthaman, ‎owner of Vettri Theatres in Chrompet. Following response from people overseas, especially after the Dubai premiere, the makers have decided to trim the length of the Kamal-starrer from 2.52 hours to a more palatable 2.30 hours. Kamal's representative announced this, despite Qube not confirming that they had gotten word of any modification in length.